Hello, I'm Gregor and I put this site together. At first, you'll find an overview of recommended cotton candy machines, followed by a public poll and a general buying guide on cotton candy machine. 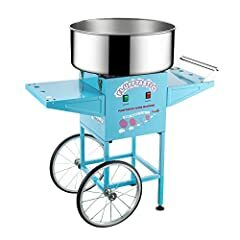 Further down on this page, we do link to other well-written articles and reviews about cotton candy machines. At last, you'll be able to weight in your own opinion in the comments section. 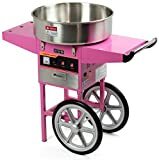 If you also want to vote on the best cotton candy machine, click here to view the poll. Almost everyone has fond memories of cotton candy from their childhood. There's just something about that sticky, colored sugar sticking to your fingers that creates unforgettable memories. 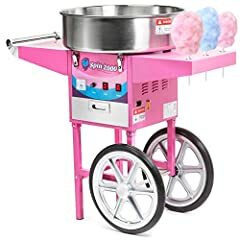 If you're in the market for a cotton candy machine, you're on your way to helping to create those memories for the next generation. Whether you're shopping for a machine for personal use or for your business, read through our buying guide to gain a better understanding of how you should approach buying your very own memory-making, sugar spinning machine. 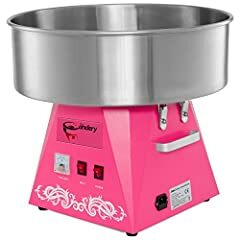 Before looking into your buying options, consider whether you actually need to buy a cotton candy making machine or if renting might be a better option for your needs. Will you be using the machine for just one event? If you're going to use it for more than one event, how often will those events be? While rental prices vary by region, before committing to the cost, storage, and upkeep of owning your own machine, check out local options for renting if you will not be using it on a regular basis. 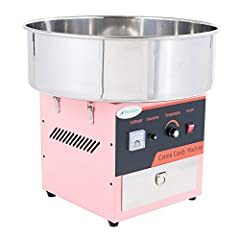 Step one to buying a cotton candy machine is determining a clear understanding of how you'll be using the machine (i.e. personal vs. commercial use). The main technical difference in these two types of machines is the volume they are able to handle producing. This includes both the output they can create and at what speed they can create that amount as well as how long the machines be able to produce what you need it to before breaking down, i.e. durability. The durability and volume will be reflected in the size of your machine and the materials it is made from (plastic vs. stainless steel, for example). These differences in volume production and durability are going to be the main determinant of cost differences between machines as well. 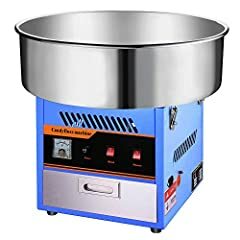 Some key things to look for while perusing machine descriptions besides just volume, speed, and durability (as suggested above) including temperature adjustment abilities that will allow your cotton candy to come out perfectly fluffed and a detachable bowl that makes for easy cleaning. These features will be listed for a wide range of machines and will not be the primary search terms when you look for your new machine. So you've decided that buying is your best option, and you've decided what size and quality of machine you'll need, so now what? What else will you need? Look through our list of additional parts and accessories to help you determine what you may need based on your individual needs. Will you be making cotton candy outside? Then you'll probably want a shield. This covers the top of the machine to protect your sugar/cotton candy from unpalatable insects, dust, and other debris. 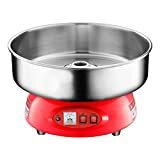 Additionally, it helps to keep your sugar within the machine, rather than flying into the air, covering nearby surfaces like countertops or windows, or ending up on the floor. 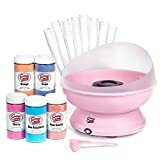 Before looking for any other accessories, you need to decide how you'll be serving up your cotton candy, i.e. in bags or cones. These different serving options can affect the type of cart or other storage you look for next. While cones have the classic, fair look that makes every customer (or party guest) nostalgic, bags allow for more cotton candy to be stored and served up at one time and also allow the cotton candy machine operator to make several servings in advance and store them in insect, rain, and dust-proof bags to handle high volume situations with a hassle-free approach. Keep in mind that if you are going the bags approach, you also need to consider how you'll be sealing your bags--twist ties, a bag sealing machine, bag clips, bag-sealing tape, or leaving enough room in the bag to knot the plastic itself. Will you be primarily staying in one spot with your machine or are you hoping to be able to travel around (for example, walking around a party or bringing your machine to events in different locations)? If you're planning to be moving around, a cart can greatly increase your cotton candy-related mobility while also adding a bit of attractive whimsy to your cotton candy set up. Looked for carts that are easy to wheel around and lightweight and then look for special features like a cone holders, cash drawers, or extra handlebars or racks. Once you start making your cotton candy you might find that you struggle with the cotton candy flying out of the bowl, wasting precious product. A wide variety of leather, metal, and plastic stabilizers and floaters are available to meet your needs and keep your cotton candy stabilized and in the bowl. 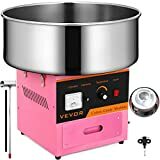 You have your machine, you have all your accessories, you know how you're going to be serving up your cotton candy and to how many people, but what about the actual ingredients to make the cotton candy itself? The first step in getting your ingredients is determining if you prefer premixed options that are sugar and flavors already combined creating a convenient, fast, and consistent product. These mixes come in packs of single flavors or variety packs to help you satisfy each guest you'll be serving. Many options will also ensure they are gluten, dairy, and peanut free so you can ensure you are feeding your customers, even those with food intolerances and allergies, safely. Pretty much any flavor you could imagine is available in these premixes from the classics like silly nilly (the classic pink vanilla flavor) and boo blue (classic blue raspberry) to new concoctions like bacon, chocolate covered orange, and chocolate cherry flavors. If premixes aren't your thing, you'll just need a concentrated product like Flossine to mix with sugar to create your candy floss. This colored, flavored, and concentrated product helps to create fluffy, flavorful favorites that won't clog up your cotton candy machine. While this option allows you to customize your product, it can create inconsistencies between servings, especially if different individuals are creating each batch so make sure you have your recipe down to exact measurements to offer up the same, delicious product each time you serve! Both options are easy to use and well-regarded within the cotton-candy-makers community, it's mostly about personal preference when it comes down to making your personal recipe of cotton candy so try them both out and decide what works best for you! While this may seem like a lot of information to process, don't be discouraged! Once you have your rig all set up, cotton candy is an easy-to-make treat that everyone will love! New: Our editorial list of additional articles. 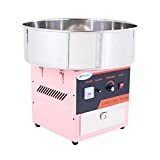 We decided to gather informartion all around the internet and present you a list of helpful, external links to interesting reads about the best cotton candy machines and their reviews and guides. 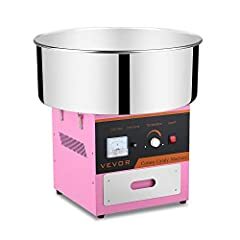 You're not convinced by the previous writings about cotton candy machines? Of course you can just choose by visual impression, that's why we present you all our chosen products at a single glance. A click on any image is enough to open an external link to the best offer we could find. Today - COTTON CANDY MAKER - DOES THIS THING REALLY WORK? Finally, we want to present you our rating criteria for our cotton candy machine comparison, so you can better understand and comprehend our recommendations and the rating process itself. 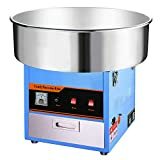 Furthermore, we still ask you to keep your eyes open for short term deals in order to make some great bargains with cotton candy machine in 2019. Published by G. Krambs on StrawPoll.com (last update on 2019-04-18 08:02:02).